If there's one thing in the video game world that's been twisted and misunderstood more than anything else, it's the timeline for the Legend of Zelda series. Due largely in part to both A) Nintendo not making the effort to make the connections between the games clear, and B) Nintendo of America putting a timeline up on the official Zelda site that in no way makes any sense, fans of the series are lost and confused. Well fear not, fellow readers. After hours upon hours of research, and lots of help from our fantastic forum-goers, I've managed to compile what I think is the most accurate representation of the Zelda timeline available. So what constitutes an accurate source for a feature like this? Not the Zelda comic books, that's for sure. And certainly not the old Zelda cartoon. All my information is taken either directly from the games themselves, or from their respective instruction manuals. Anything else you see is simple deductive reasoning. After all, and I'll be the first one to admit it, there are a LOT of plot holes. Amazingly, though, Nintendo seems to have created a timeline that accidentally makes perfect sense. You just have to immerse yourself in the source material for long enough. And that's that. Each grouping of chapters takes place in the same time period, with the same Zeldas and Links between them. And don't worry, both Zelda IV and Zelda I being in the same time period at the end makes perfect sense. If you read the chapters, that is. So what's stoppin' ya? Click the link below to begin, or choose a specific chapter using the table of contents in the info panel to the right. And one last request. Please, spread this timeline around. There's so much misinformation about this series running rampant in the gaming community that it's occasionally hard to stomach. So any time someone mentions something you just KNOW is wonky, kindly point them to this url. Hopefully, together, we can eliminate all possible confusion. And by all means, if you've got something to add or comment on, drop me a line or talk about it on our forums. Greetings, visitors from digg.com. Since we seem to be getting a huge surge of new visitors to an article that was primarily written nearly four years ago, I just wanted to make sure you all knew that... this was written nearly four years ago! While I do still agree with a number of the things I brought up in this piece, many many things have changed since then. New games, new theories. So while I'm glad that you're all enjoying the piece, make sure to remember that it's hardly indicative of the current state of the Zelda timeline. I suppose I owe a bit of an explanation here. A very very long time ago, I started rewriting and revamping this particular little feature. I completely redid the first two chapters, but ended up having to direct my attention to other site projects. This does not mean that this project has been abandoned, however. 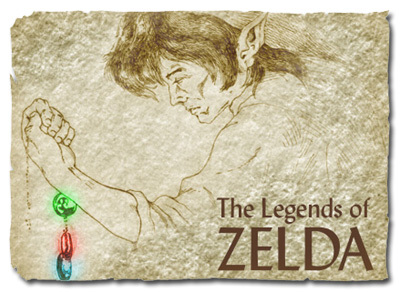 While this will be the last update to the "Legends of Zelda" feature, its spirit will be carried on into one of the largest projects this site has ever seen. You'll see a hint as to its nature in a few months. But what about the two chapters I rewrote? Well, I just uploaded them. Chapter 1 has been expanded with more insight into the creation of Hyrule and the original Zelda tragedy, while chapter 2 has been exponentially expanded upon in multiple facets. Of key importance is the end of the chapter, where I present a much more believable explanation for the confusing time-paradox events that take place at the end of the game. Hopefully it will keep you excited for the launch of our "project", which will bring N-Sider's discussion of Hyrulian lore right back up to date. Now don't be fooled, this isn't an ACTUAL update. Just letting you people that this timeline isn't a lost cause. I've been working on v4 for the past several... months. I've still got some more to do, but once I'm done this Zelda timeline will be next on my priority list. It won't be any time especially soon, but it's definitely coming. So no one fret. You'll all be pleased with the results. Update! Well, not really. Just checkin' in to let you all know that an update is indeed pending. I'll be working in The Wind Waker fully, as well as significantly beefing up and editing some of the other chapters. I am well aware of the issues that The Wind Waker has brought up, and I've got some interesting ideas for dealing with them. I've also got a new page in the works that focuses solely on the reasoning behind placing the games in the order I did. Finals are coming up for me in a week or so, though, and E3's the week right after that. So if all goes according to plan, I should be able to get some serious work done on this after E3 and get it up sometime in May. I'll probably be working on a bunch of post-E3 related articles as well, though, so I'll try my best! But yeah, thanks to everyone for your continued interest. Rest assured, it will be worth the wait. Comments? Questions? Feel free to drop me a line by clicking below.